On Monday October 15th Acne held a champagne reception at the Four Seasons Restaurant in New York to celebrate the launch of Acne Paper no 14 dedicated to Manhattan. Among the guests were Sofia Coppola, Clemence Poesy, ACNE's chairman Mikael Schiller, ACNE Paper's Thomas Persson and Duncan Campbell, Alexa Chung, Alba Clemente, Eric Boman, Peter Schlesinger, Simon Doonan, Olivier Theyskens, Michelle Jank, Caroline Winberg, Lily Donaldson, Dorothea Barth Jorgensen, Hanne Gaby, Mirte Maas, Alana Zimmer, Jeremiah Goodman and ACNE's Louise du Toit. 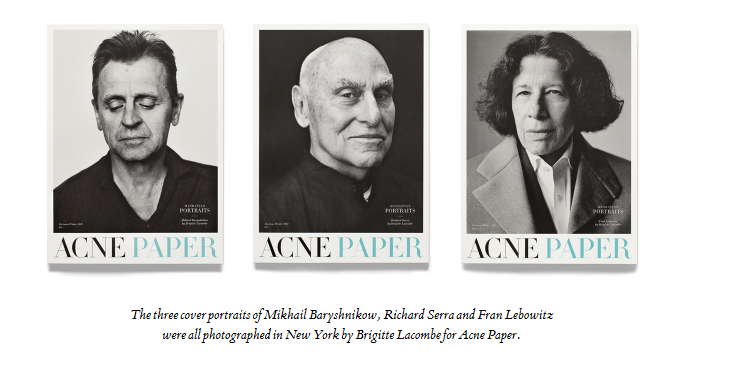 Fitting to the Manhattan theme it will be the biggest issue of Acne Paper: 272 pages, a celebration of the many aspects that make up the cultural fabric of the great metropolis. Observed through photography, art, literature and journalism, the issue is a love letter to the city, illuminating its fascinating history while reflecting upon key personalities and current events, exploring the artistic greatness of New York and America itself. The issue no 14 comes with 3 different covers, either graced by Mikhail Baryshnikov, Richard Serra or Fran Lebowitz.